Serving Melbourne, Geelong, Ballarat and everything in between! Need a comprehensive condition report but don’t want to spend a fortune? We can send an industry recognised RBI expert to inspect the property. They will zero in on any potentially expensive problems or, fingers crossed, provide a concise report that shows the property is sound. Guaranteed lowest price: If you find a lower comparable price, we’ll price match it! Guaranteed latest technology: We only use the latest thermal sensor and moisture technology available. Guaranteed expert inspectors: Our inspectors are all licensed builders and licensed building and pest inspectors. Want to be present during the inspection? Sure! Feel free to watch your Inspector in action. At the end of the inspection – at your request – your Inspector will be very happy to walk you through the report. It is always a good idea to get the second option of an industry expert while making a property investment, despite being told by the real estate agent that the property is in “as-new” or “excellent” condition. In fact, the painted areas could be concealing flaws or rotting frames that require costly repairs and maintenance. Our inspector can help to protect your investment by looking out for any defects and coverups by the homeowner and determine the extent of the damage. Our specialist team will carry with them specialised equipment and tools, powerful torches and ladders to inspect all the visible areas of the property. And, to check the insides of the walls for any moisture, leaks or termites, they will make use of thermal and radar equipment. And, all these services are offered at no extra cost and are included in the base fixed cost. Our services are extremely cost-effective without making a dent in your pocket. Buying a property will be one of the largest investments you will ever make. That’s why we deliver easy-to-read reports to help you make the right decision. Our condition reports are following Australian Standards and are recognised by real estate agents and solicitors. The report will give you the peace of mind to make an informed decision about purchasing a property in Victoria. It may even help you dodge a bad deal that could costs you thousands in repairs. Here’s how we prepare your condition report. Costs Are Dependant On The Number Of Rooms And Property Size. Why Choose Rapid Building Inspections in Victoria? While training is great, nothing beats industry experience! Every inspector is a licensed building and pest inspector which means they are experts and will be able to spot issues less experienced inspectors could miss. We are active members of the IBC and regularly meet to improve our capabilities in building inspections, timber pest inspections and pre-purchase inspections. Our inspectors follow the Australian best practice in pest inspections and are trained and qualified according to the Australia inspection standards AS4349.3. We are authorised to conduct pest inspections throughout the greater Victoria. All our work comes with professional indemnity insurance of up to $5,000,000. We won’t need it, but it’s nice to know you’re protected if something does happen! The ‘Remote Thermal Sensor’ can pinpoint significant heat sources generated by termites within conventional building structures and the Termite Detection Radar accurately detects and confirms the presence of termites in the suspect areas. 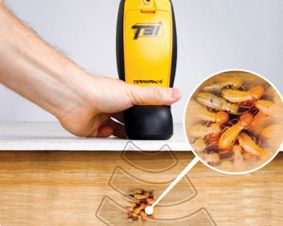 It can also trace and locate termite nests and entry points. The ‘Remote Thermal Sensor’ can pin-point significant heat sources generated by termites within conventional building structures and the Termite Detection Radar accurately detects and confirms the presence of termites in the suspect areas. It can also trace and locate termite nests and entry points. As we know the report is time sensitive, once payment is received, we will get it to you within 24 hours, or your money back. But just because we’re fast, doesn’t mean we cut corners! Every pre-purchase building and inspection report has to pass a stringent quality review from our head office before it’s sent to you. Our commitment to our customers is to provide a high-quality and 100% unbiased pre-purchase building and pest report at a great price! How do we do this? It’s simple! By having minimal face-to-face interaction between the RBI Victoria Inspector, the owner and the real estate agent selling the property. This lets our inspectors get on with the job of inspecting the property and getting the report back to you! Coordinating access to the property can be time-consuming, and we can’t afford to have our inspectors calling agents and sellers to arrange access. Therefore we need guaranteed access organised by you for our inspectors at the agreed date and time. If you can’t secure a time for them to access the property, let us know 24-hours in advance so we can book another time. We’re happy to answer all your questions – even the hard ones. So give us a call today, and get the information you need from one of our team members. Check for moisture, mould, cracks pest evidence.. Look for favoured pest habitats. We service Ballarat, Melbourne to Geelong! What does rapid mean? It means fast dispatch, not missing the appointment and efficient turnaround time for your report! When can you do the inspection? We never turn work away, so we will endeavour to make a slot available to you at the earliest convenience. Could I attend the inspection? Yes, you can be on-site when the inspection is taking place, that way, you can talk to the Inspector directly and discuss any issues. However, we do ask that you allow the inspector to conduct his inspection unhindered and save questions until he is finished. This helps to ensure a thorough and uncompromised report. Do you check the loft and roof? As long as our inspectors are able to gain access, they are areas that we will check. What is included in the report? 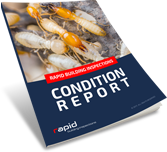 The report includes either a building inspection report, a pest inspection report or both. And all in easy-to-understand English. Can I rescind my contract based on your findings? Our condition reports are in accordance with current Australian Standards and are therefore recognised by real estate agents and solicitors. Provided you have special conditions in your contract, RBI’s condition report is known as proof. What happens after I book an appointment? Our RBI concierge will call to confirm the details of your property. We will dispatch the RBI inspector at your confirmed access time.